Located in Upstate New York, Tompkins County contains nine towns, six villages and is home to the City of Ithaca, one of the principal cities of the scenic Finger Lakes region. The City of Ithaca, the heart of the Ithaca urbanized area, is centrally located within Tompkins County, at the southern end of Lake Cayuga. In 2000, the urbanized area population was 53,528, 55.5% of the total population of the County. 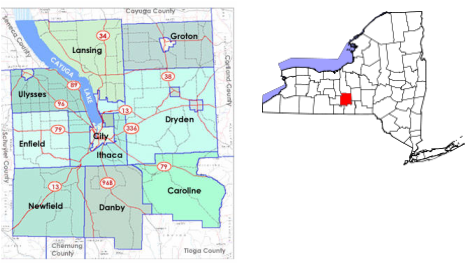 Tompkins County is an education center and is home to Cornell University, Ithaca College, and Tompkins-Cortland Community College. These institutions provide important sources of revenue, employment, and cultural amenities for the residents of Tompkins County and region. The County has increased in population and employment every decade since 1920. The County is an important regional employment center and imports 20% of its labor force.